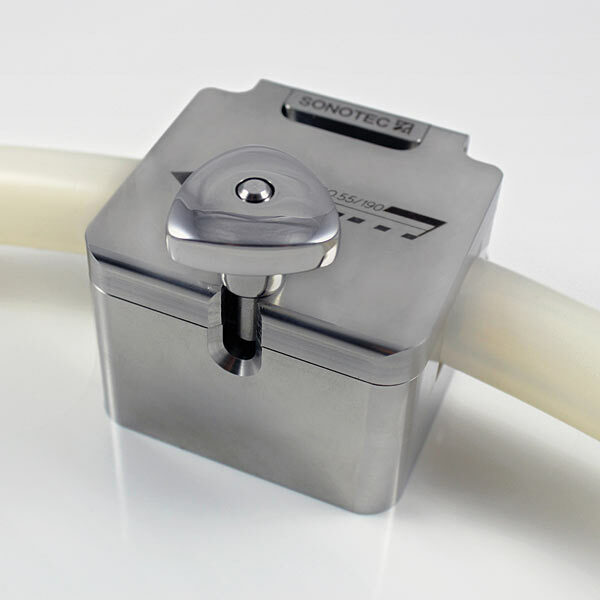 SONOTEC equipped the new version 2.0 of the contactless clamp-on flow sensor SONOFLOW CO.55 with additional outputs. Now the compact ultrasonic flow meter is able to perform small control tasks and can be used in more versatile applications. The non-invasive ultrasonic flow sensor SONOFLOW CO.55 V2.0 detects the flow rate of liquids in flexible tubes within a few milliseconds. The application fields are manifold: medical technology, biotechnology and pharmaceutical industry as well as chemical and semiconductor industry. Due to the new current, frequency and switching outputs industrial dosing applications can be perfectly supported. manufacturing to fill and finish operations. Due to large volume production SONOTEC can offer the most economical prices in the industry. Due to its construction the non-invasive clamp-on sensor is particularly suitable for applications in fields with strict hygienic standards. The tube is easily put into the sensor and enables a smooth and uncomplicated change. The SONOFLOW CO.55 V2.0 is constructed as a built-in component for machines and apparatus. The electrical integration into the control system can be carried out easily. The sensor has got a configurable current or pulse output. The service interface allows an easy parameterization, calibration and readout of measuring values. This method can be adapted to individual tube sizes as well as other specifications, such as different voltages, switching outputs or material characteristics.